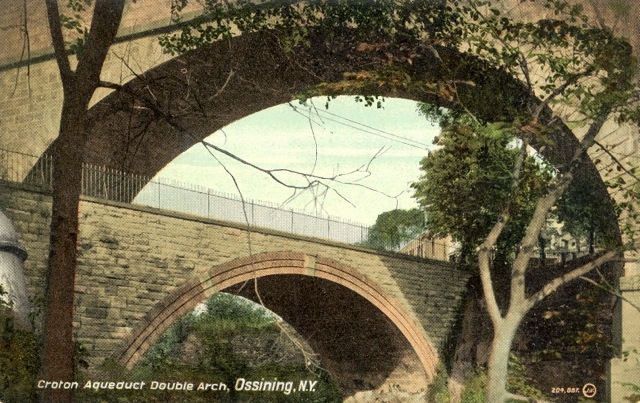 The promenade across Ossining’s famous Double Arch has been restored and will be reopened on Saturday, July 20, with an event taking place from 4 to 6 pm. To celebrate, we’ve assembled a group of images relating to this famous local landmark. Click on any image to enlarge it! Cutaway views showing interior construction, circa 1837. See previous image, which shows where these sections were located. Painting by Frederick Agate, circa 1839, of Whitson’s Mill, located to the east of the aqueduct arch. Shortly after this was painted a wooden bridge was erected under the arch to cross the Kill. The original painting is in the collection of the Ossining Historical Society. Lithograph showing the wooden bridge built under the aqueduct arch sometime after 1839. From F.B. Tower, Illustrations of the Croton Aqueduct, New York: Wiley and Putnam, 1843. Detail of the wooden bridge that originally carried local traffic under the arch. F.B. Tower, Illustrations of the Croton Aqueduct, New York: Wiley and Putnam, 1843. View looking east, showing the smaller arch over what is today Aqueduct Street on the far left. F.B. Tower, Illustrations of the Croton Aqueduct, New York: Wiley and Putnam, 1843. Detail from F.B. Tower, Illustrations of the Croton Aqueduct, New York: Wiley and Putnam, 1843. Stereoview by H. Rofes & Co., circa 1865, showing the Arcade File Works (erroneously called “Arcade Tile Works” on the paper label on the back). The company began operation in 1848 in the old mill and a new building next door. The mill power was used by the factory, which stayed in business until the early 1900s. The firm took the name Arcade from the aqueduct arch spanning the valley. This detail from the previous image likely shows students from “School No. 1” which was west of the Arcade File Works on the other side of the Double Arch. Later view from the Kill, showing the Arcade File Works mill dam and water wheel. Detail from a stereoview looking southwest down the Kill, over the Arcade File Works mill dam. Looking south across the promenade. The steeple in the background is the First Presbyterian Church. The church blew down in windstorm around 1900 and was never replaced. The Art Nouveau frame and “Private Mailing Card” label on the back of this post card helps date this image to 1898 to 1901. During the heyday of postcards in the early 20th century the Double Arch was an often-photographed New York landmark—as this example and the selection that follows attest. A highly retouched night view, created using the photograph of the previous card. An early 20th century view of the promenade, looking north. The view may not look the same, but today New Yorkers will once again be able to stroll across this 19th century engineering marvel.